The Lionfish Dungeon is a safe and efficient containment tool used for harvesting the invasive lionfish. It is equipped with a one way trap door, allowing the diver to spear the venomous creatures and shove them into the tube while the lionfish is still on the spear tip. The lionfish stays in the tube when the pole spear tip is pulled back out. 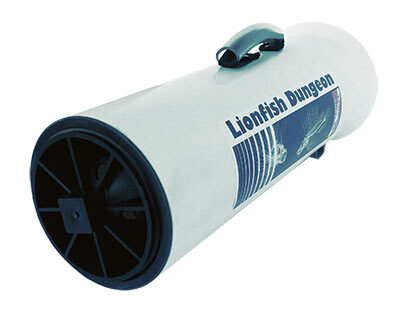 The Lionfish Dungeon includes a carrying handle, lanyard, clip and screw-on rear cap for easy removal of the lionfish. The container comes with handle which is comfortable underwater and on the land. The lanyard is not enough, drags the container on the bottom. I had to add additional lanyard to fix the container in good position. The tongue can grab the neck of the spear tip, need some practice how to pull out after the fish was pushed in. Altogether, it is a good LF container definitively worth its price.